TinaShe is a business strategist, digital media expert and Publisher of News24, Media24’s flagship digital news asset. In his current role, he is responsible for the commercialisation of South Africa’s single largest digital audience. In 2018, he was selected as one of the Top 100 Most Inspiring MBAs in the world. TinaShe is passionate about creating free access to information and education. He explains how in the past people paid for access to the library and would be able to find information in this one space. Tinashe emphasises that with new technologies developing this has changed and that there are new barriers to accessing information such as the high price of data. TinaShe is passionate about creating access to information to different audiences and believes that everyone should have this access to grow and learn “regardless of who they are”. He, therefore, led the digital media team that pioneered one of Africa’s first MOOCs (Massive Open Online Courses) into two of the largest international platforms. His drive, ambition and team spirit has meant that he has collected prestigious team and individual awards such as World’s Best Mobile App, IAB Bookmark Honours celebrating excellence in digital, SAFTA and Exceeds award (individual). TinaShe completed his B.A. Film & Media Production, Screen Production in 2009. 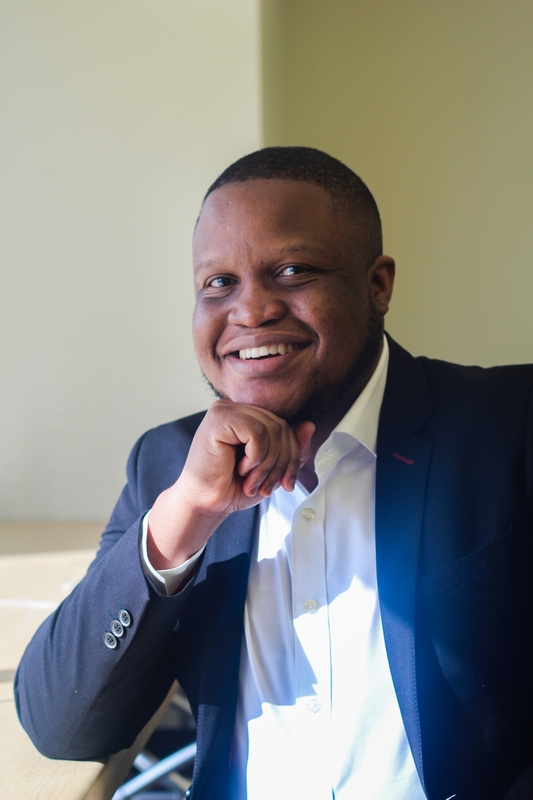 During his time at the University of Cape Town (UCT), he was actively involved with 104.5FM (then UCT Radio), where he was Advertising and Sales Manager and hosted a talk show on current affairs. and UCT RAG, where he was a co-producer/editor. Whilst completing his undergraduate, he worked at 104.5FM as Advertising and Sales Manager. He graduated with his B.A. Honours in Film Theory & Practice, Documentary & Narrative Filmmaking in 2010. During his honours year, he worked as a film/media mentor for the World Film Collective. In 2011, he acted as the Executive Board Secretary for the Documentary Filmmakers association of South Africa whilst also being an executive committee member of S.A.G.E South African Guild of Editors. During this time, TinaShe worked as the postproduction manager at Plexus Films until 2013. He then returned to his alma mater to take up the position of Digital Learning Materials Designer and was then elevated to the Head of Digital Media. In 2014, he completed is Masters of Business Administration. Thereafter, TinaShe took up his current role. TinaShe is interested in exploring e-commerce, fintech and the media landscape. He shares that employers are a lot more open to employing workers who are versatile. He says that it is important for students to, “hustle hard and work differently”. TinaShe was extremely driven and stated, “I know what I want and what I want to achieve”. He says that it is important to go above and beyond to achieve your goals. He shares that it is important to remain flexible because that is what makes you more employable and can set you apart. TinaShe’s advice to incoming and current students it to “Know your worth and be open to compromise”.